There's something calming that accompanies the sound of the ocean water splashing against the rocks while the breeze caresses your face. Sticking your wet toes in the sand while you stare across into the horizon and forget everything that's on your mind. At least that what's we anticipated when we took a quick day trip to the beach in Santa Cruz. Amusingly enough, it was quite the opposite. The winds were very chilly and wild! So was Snoopy, the thought of sitting down calmly was not something he was in the mood for. He wanted to play with the other dogs and eat sea weed. The two of us struggled with our packed lunches which kept getting stuffed with sand. Finally we looked at each other after spending two hours of frustration trying to battle the cold winds and sand and decided that perhaps this would have been a calmer day if we stayed at home. We walked back to the car, more annoyed than ever and began our drive back home. After a few minutes in the car driving, we looked at each other and smiles started to form which turned into laughter. While the dog was being crazy at the beach he had now sunk into a deep state of slumber in the back seat of the car while the two of us were exhausted from all the craziness of those two hours at the beach. I really feel these crazy things happen only to us but then again we might not remember these moments years from now! I'm sure we will go back to the beach and definitely be better prepared than our first visit! What would life not be without a little bit of craziness or spice for that matter! 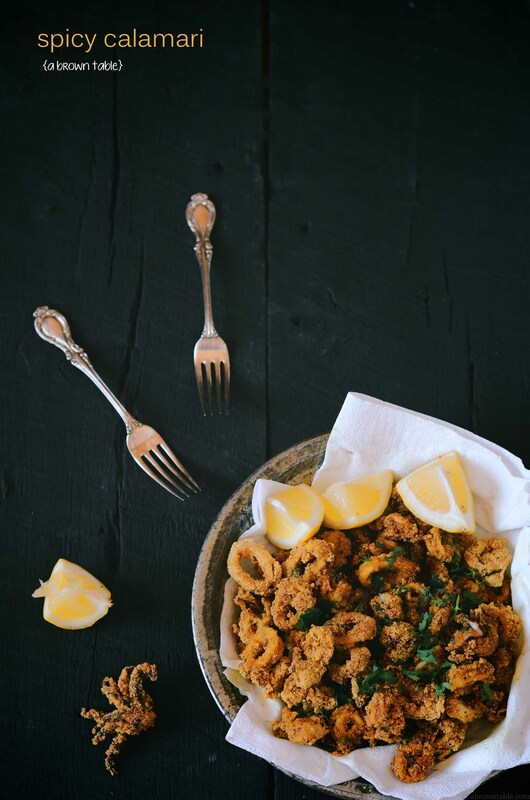 Calamari is one of my favorite seafood appetizers to eat in summer and I'm sharing one of my favorite ways to make calamari at home. I've added several ingredients that are commonly used in Goan cuisine that give these guys a delicious flavorful kick. Cornmeal gives these squid a super crispy crust that with will make you want to eat more with every crunch bite. 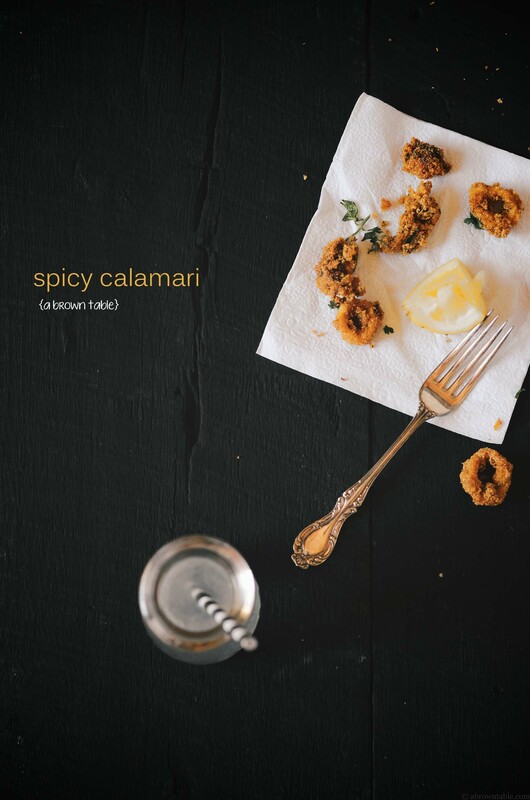 I'm not a big fan of dipping sauces when it comes to eating calamari, I prefer a splash of fresh lemon juice over them but feel free to pair this with your favorite dipping sauces. 1. Wipe any excess liquid from the squid using clean paper towels. Using a sharp knife cut the head off and the body into rings, place on a clean paper towel. 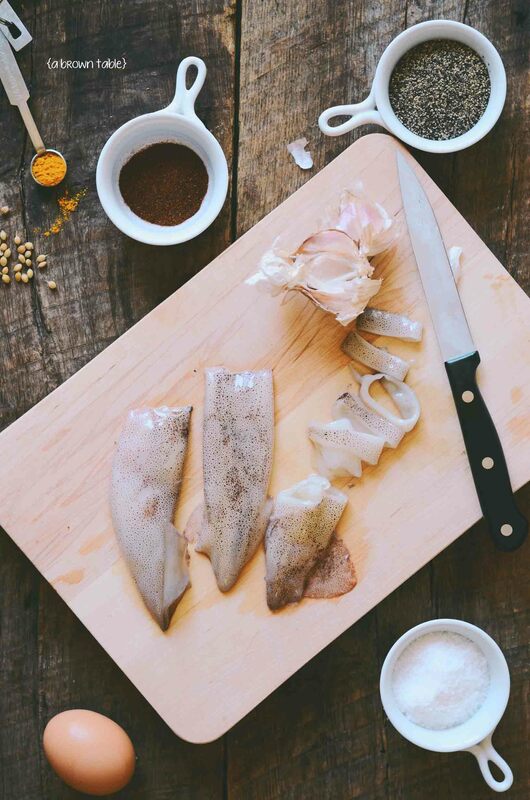 (Food52 has a great tutorial on how to clean and cut squid). 2. In a mixing bowl, whisk the egg. Add all the ingredients from the sea salt to the cornflour and whisk until completely combined. Fold in the cut squid until coated evenly. Allow to sit for 30 minutes in the refrigerator. 3. Heat 2 inches of the oil in a wok on a medium-high flame. In the meantime, place the cornmeal in a medium-sized tray. Using a fork pick up the marinating pieces of squid and toss them in the cornmeal until completely coated. Place the coated pieces on a sheet of parchment paper. 4. As soon as the oil gets hot at around 375F, fry about 1/4th of the cornmeal-coated squid until golden brown (don't overcrowd the wok or they won't cook evenly). 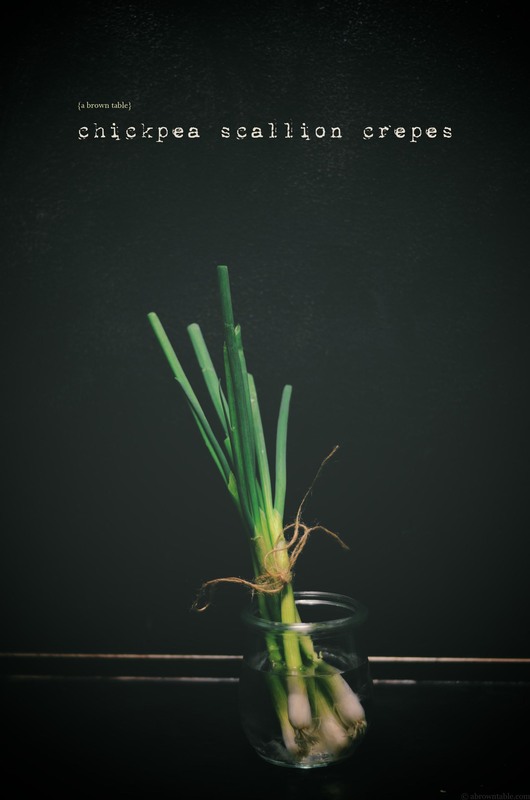 The squid will cook within 1 to 1 1/2 minutes, immediately transfer with a slotted spoon onto a clean sheet of absorbent paper towels to drain the excess oil. Repeat with the rest of the squid. 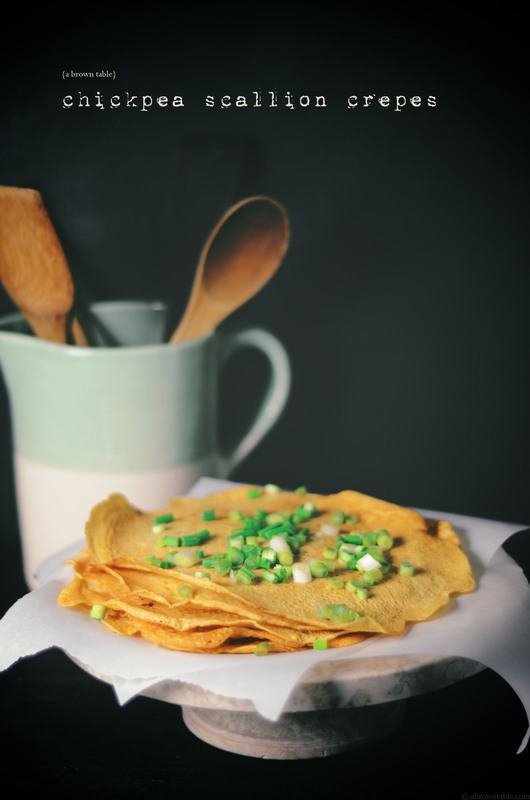 Serve hot with fresh lemon wedges and garnish with a little fresh cilantro or parsley leaves. In "Goan", "Indian", "Spicy", "calamri", "gluten free", "sea food", "squid"
The fun part about exploring the local markets in your new neighborhood is the fun things you might come across. 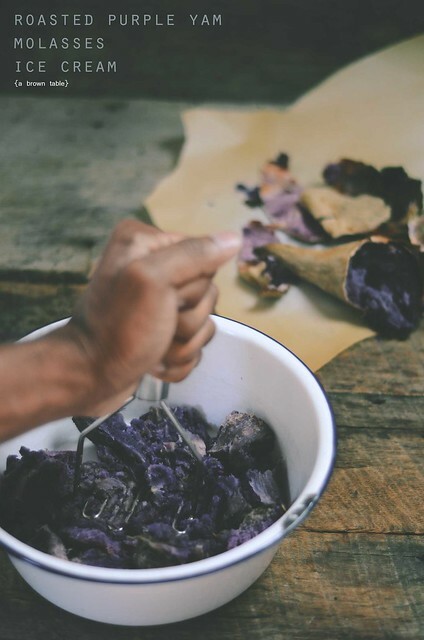 My eyes and heart burst with excitement when I came across these purple/violet yams/ube in my neighborhood. Until now, I had never tried them and everything about these guys blew my senses away. They are sweet to taste but when roasted the yams give off a beautiful floral nectar like fragrance which frankly is kind of amazing! last year and I figured it would only be appropriate to cook these yams into an ice cream to trap those delicious scents and flavors possessed by this magic tuber. Roasting is my cheat method for many recipes, especially here because not only does it concentrate flavors and heightens tastes but it also helps to drive out moisture from the yam. I used molasses and brown sugar to sweeten the mixture and the resultant ice cream is very soft because of the yam pulp. 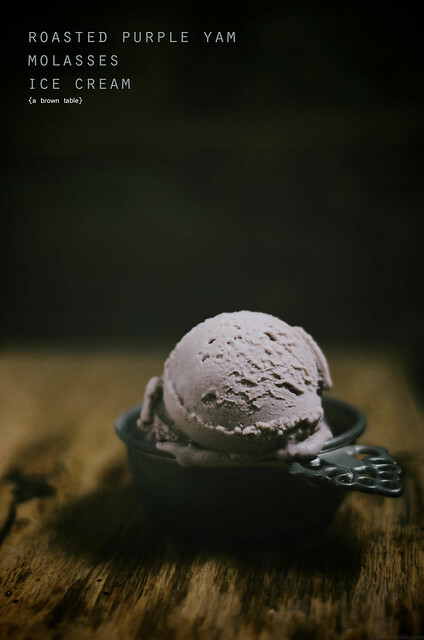 I think you're gonna love this one, so make yourself some roasted purple yam ice cream and the purple! 1. Place a wire rack in the center of the oven and preheat to 400F. Rinse the yam under cold running tap water, wipe it dry with a clean towel. Prick the yam a couple of times with a fork and bake the yam for 45 minutes or until it is tender on a baking sheet lined with parchment paper. Once the yam is baked, remove and allow it to cool to room temperature. 2. 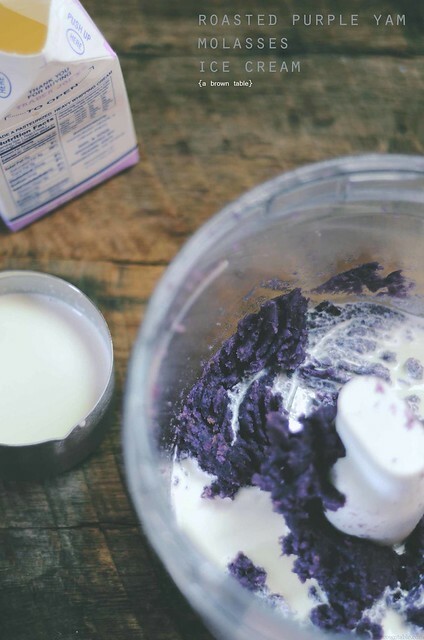 Once the yam is cool enough to handle, peel the skin and place the pulp in a food processor. Pulse until you get a smooth puree. Reserve 1 cup of the puree to prepare the ice cream. This can be done the day ahead and stored in an airtight container until ready to use. 3. In a large thick bottomed saucepan, add the milk, heavy cream, cream cheese, sugar and molasses. Stir the mixture on a medium-high flame until the sugar and molasses are completely dissolved. Reduce the flame to medium-low and whisk in one cup of the reserved yam puree. Increase the flame to a medium high and bring the mixture to a rolling boil, whisking the liquid continuously. 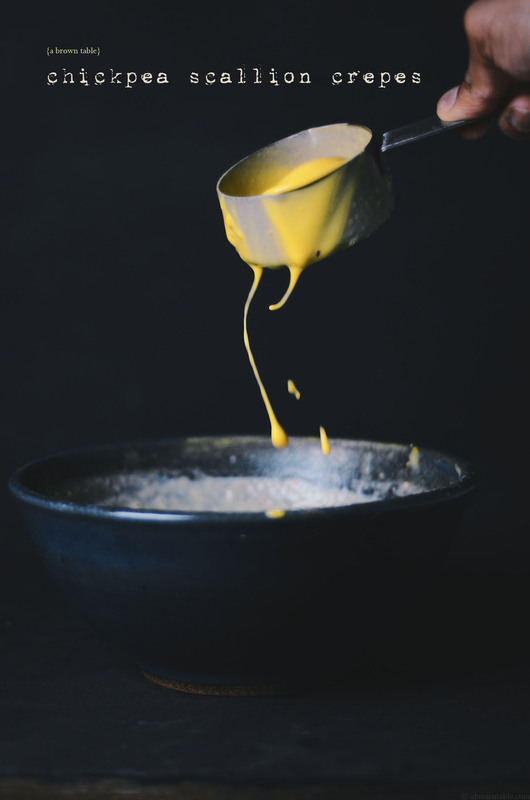 Continue to whisk and cook until the liquid acquires a thick custard like consistency. Remove the saucepan from the stove. 4. Strain the ice cream base through a sieve and transfer it to an airtight 1 gallon ziploc bag. Seal airtight and place the bag in an ice-water bath. Allow the ice cream base to chill completely for about 30 minutes. 5. Pour the chilled ice cream base into the pre frozen canister of your ice cream maker. Churn until the ice cream starts to form and no longer sticks to the side of the canister. This should take about 30 minutes (alternatively, follow the instructions that came with your ice cream maker). 6. 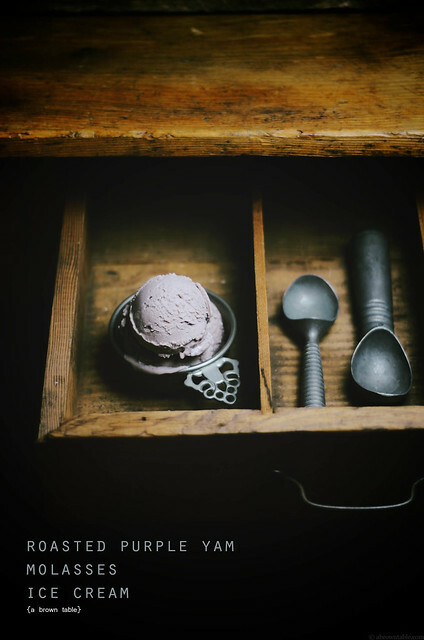 Transfer the ice cream into a freezer-safe container with an airtight lid. Press the ice cream down with a spatula to remove any air bubbles and cover the surface with parchment paper. Cover the container with its lid and freeze the ice cream for at least 4 hours or until firm. Moving is clearly insane, the last time I did a huge move was almost eight years ago and it was just me. This time round, it's the two of us and the dog and I can't just toss things out (I'm a big fan of decluttering, I get anxious otherwise) I need to think about everyone involved, what they love and what they don't. But now all of that is done with and I am focussed on our week cross country ride which is going to be the trip of a lifetime! There's new states to visit, places to see, foods to try out, and I'm a little excited that Snoopy gets to share in this big road trip adventure. I know, I sound crazy but I guess it's what dog (pet) parents get excited about. 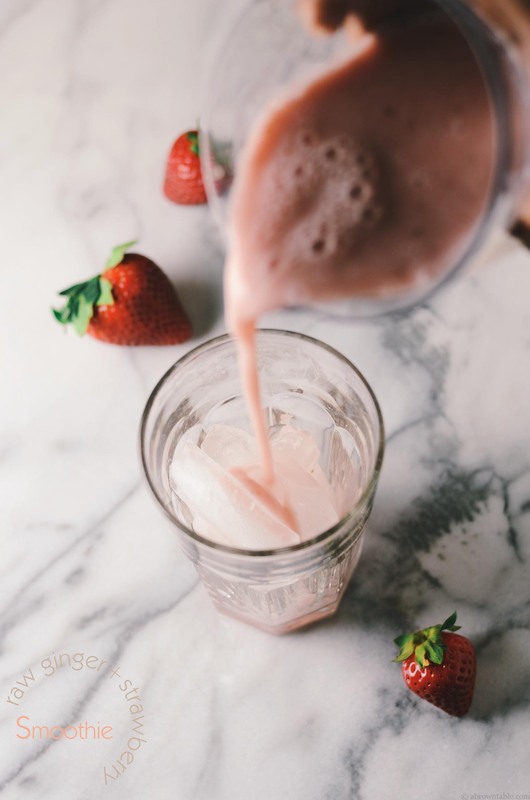 My kitchen is packed and gone but before it left, I made this delicious berry flavored coconut milk smoothie that packs the sweetness of ripe chubby strawberries and the goodness of raw ginger. There's also a reason behind this drink, I started to feel a raw uneasiness in my throat as the temperatures kept fluctuating in the weather and with the impending move and all other crazy things going on right now, I couldn't afford to be sick. Raw ginger is used as a common ailment in Indian herbal medicine so I figured why not use it to create a spring-themed immune boosting drink. There's fresh coconut milk (I used the So Delicious brand because I personally like the flavor a lot but fresh coconut milk would work well here too) and the strawberries, I used were a bit sweet so I ended up not using any sweeteners (I've listed a suggested amount but feel free to add as much or as little as you like). This smoothie turned out to be great for my throat but it's tasty enough to be served as a drink, especially as the heat waves begin to kick in. 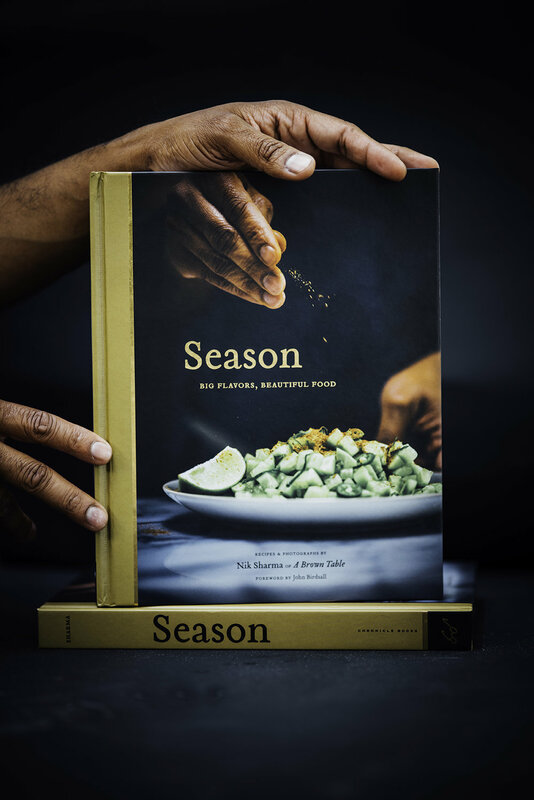 I did this fun interview with the very sweet Amina of The Paper Plates Blog, check it out if you have a moment to spare. I talk about a lot of things beyond food and maybe, my obsession with the Game of Thrones books. Linda of Call Me Cupcake made a sour cream rhubarb cupcakes (there's a ginger cream frosting that has poached rhubarb on it!!!!). Climbing Grier's Mountain's Lauren, made this hummus shrimp loaded naan pizza that is simply amazing! 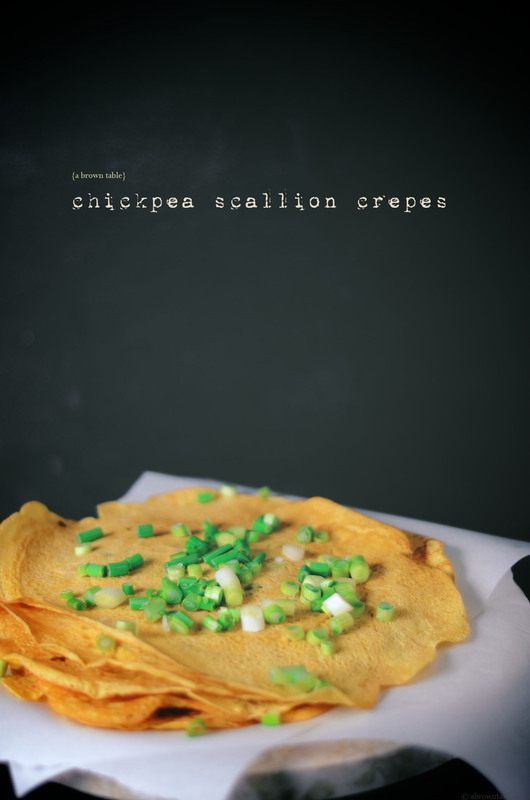 Lindsey of Dolly and Oatmeal made this gorgeous sauté that's sits on a bed of chickpea and chive mash. This is one, to see and believe, eat! This pickled chard by Love and Lemons is what's spring should be about. 1. 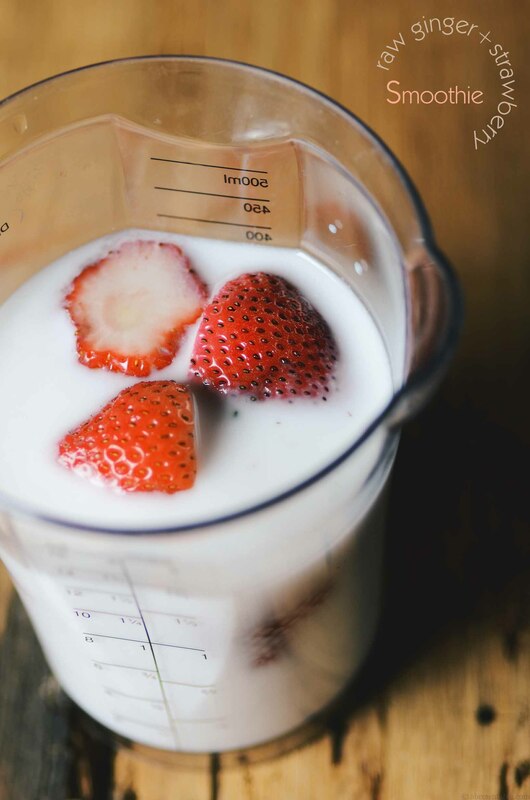 Add all the ingredients to a blender (you can also use an immersion blender) and mix until all the ingredients are completely combined. 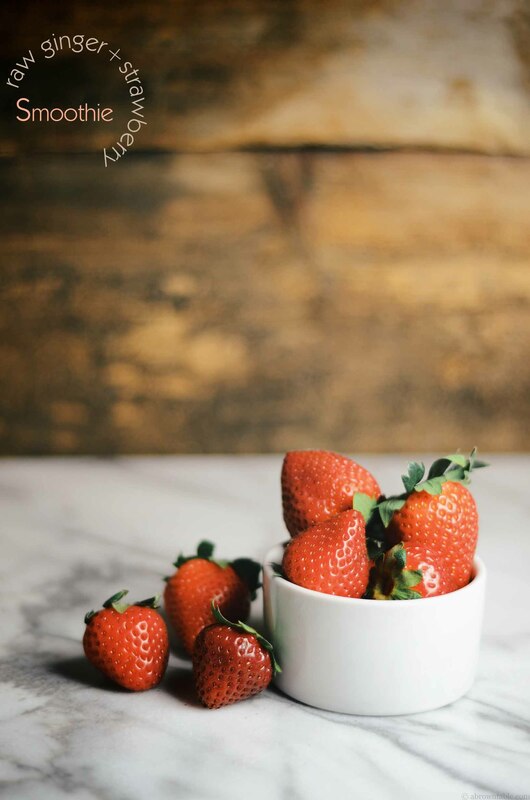 The sugar is optional, I didn't add any as the strawberries were very sweet to begin with). 2. Pour in chilled drinking glasses over ice cubes or crushed ice, serve immediately. (This best drunk fresh as soon as it is prepared). Disclaimer: I didn't receive any financial compensation or products from So Delicious and all opinions stated are solely mine. 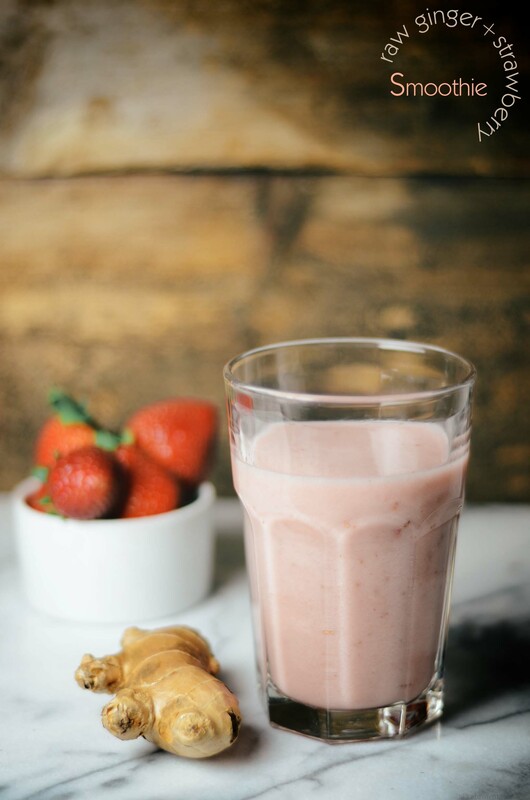 In "Drinks", "Ginger", "Indian", "Vegan", "Vegetarian", "coconut milk", "gluten free", "smoothies", "strawberries"
I have a not-so-secret love for the delicious fragrance of hazelnuts. My obsession with hazelnuts starts early in the morning when I need to have a cup of freshly ground hazelnut scented coffee beans brewing away, otherwise my coffee just doesn't taste or smell as good. I once tried searching for hazelnut wood furniture in the hope that purchasing such furniture would make my house smell perfect, needless to say that didn't work out. 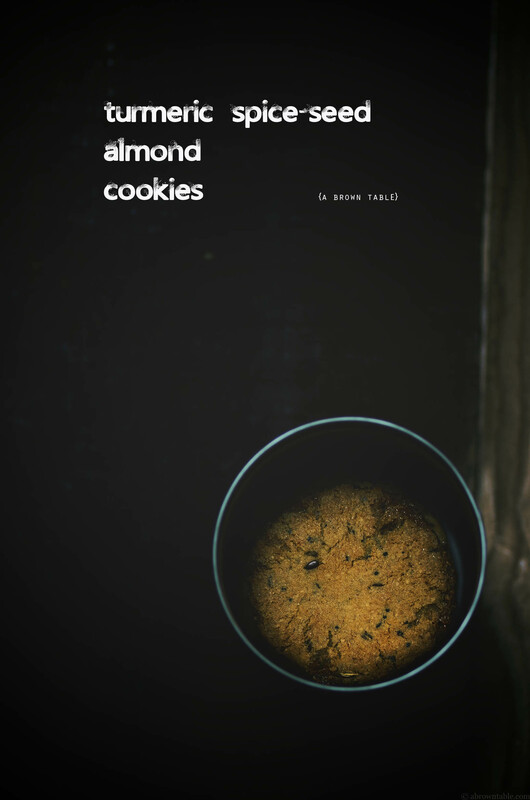 So clearly, why wouldn't I make a hazelnut cookie to go with my hazelnut flavored coffee, it just made perfect sense (in my world). 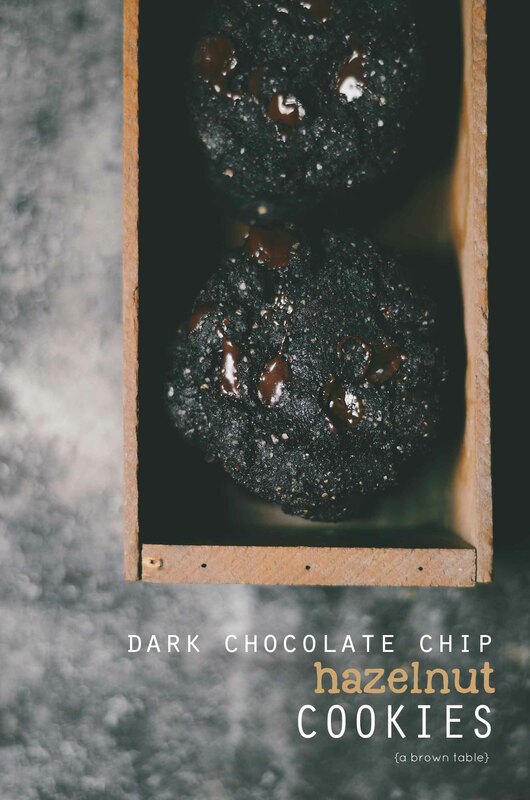 Everything about these cookies says dark, dark, dark! 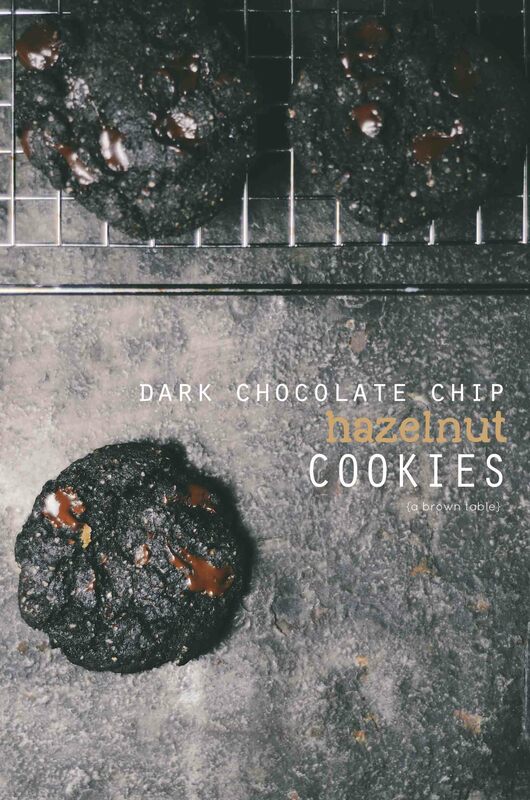 I used a very dark cocoa (if you want to go lighter in color then use the same amount of a regular unsweetened cocoa) with dark chocolate chips and a hint of browned butter all come together with the hazelnut flour to form a delicious crispy cookie. 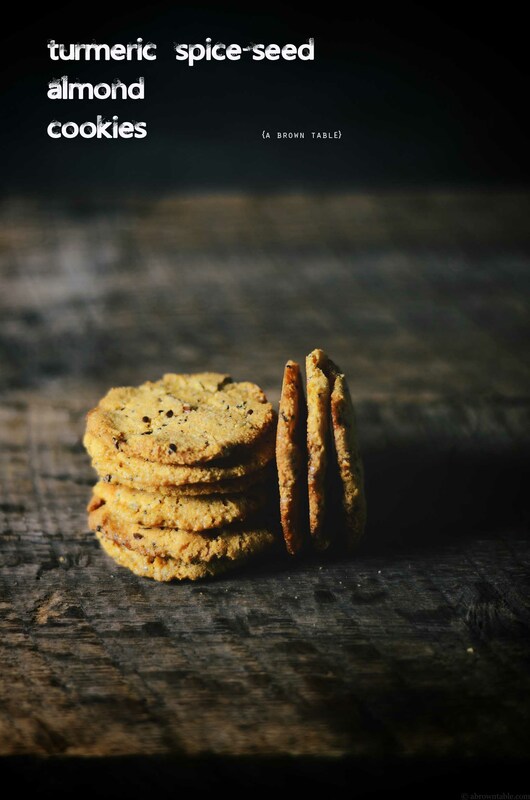 These cookies are also gluten-free so those of you with related allergies will enjoy them. I added a little hint of browned butter to bring out the nutty flavors of the hazelnuts, it gives them that extra little edge of flavor. 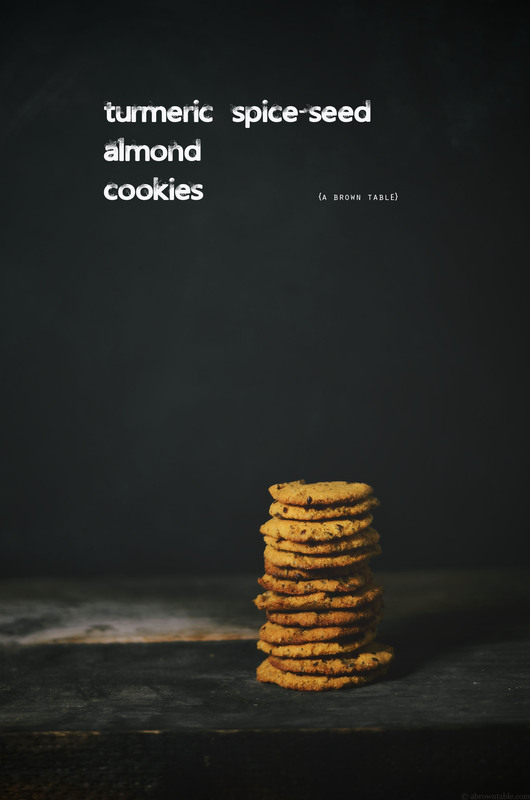 Baking with nut flours is very different from using recipes that use grain flours as nuts are rich in fats, so you need to adjust the amounts of fats depending on the type of cookie you want. Since, I wanted a crispy cookie, I refrigerated the dough overnight. 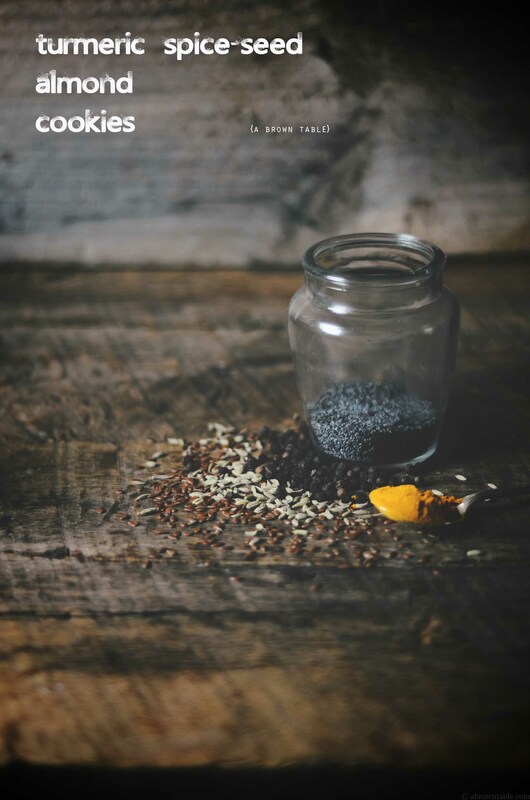 Here's another tip, when it comes to storing nut flours and keep it fresh, keep them in an airtight bag refrigerated or frozen, bring it to room temperature before use so it won't be clumpy. is giving away a bag of their delicious Hazelnut Meal and a $20 gift card to their store. To enter the contest, all you need to do is follow the instructions on the widget at the end of this post. This contest will run from March 5th through March 12, 2014. Good luck! 1. 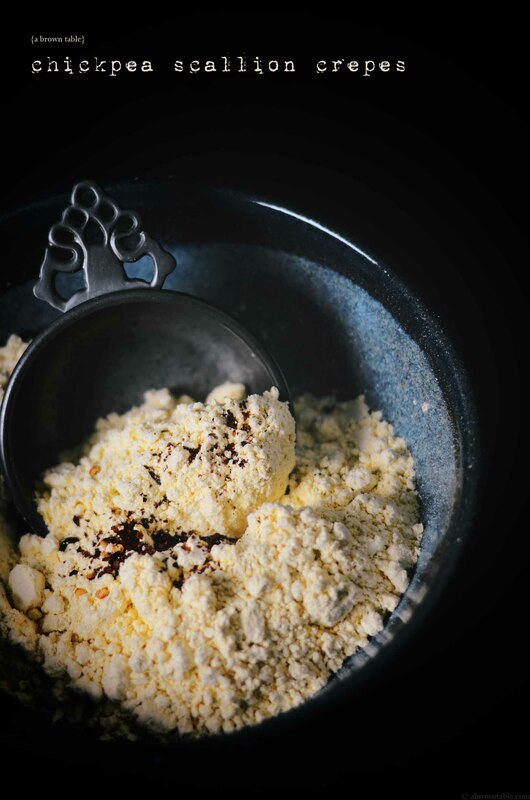 Place the unsalted butter in a small saucepan and heat on a medium-high flame for about 2-3 minutes or until the milk solids begin to turn reddish brown. Remove from stove and keep aside. 2. 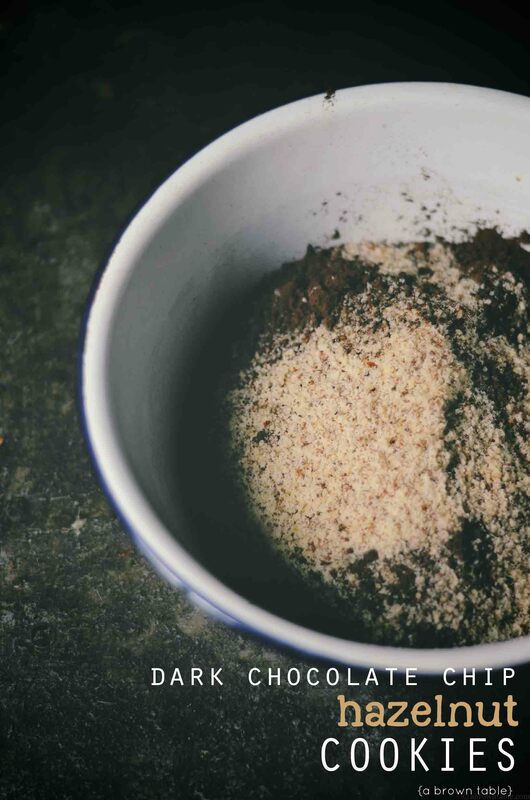 Whisk the hazelnut flour, sugar, cocoa, coffee, baking soda, baking powder and sea salt together in a large mixing bowl and keep aside. 3. 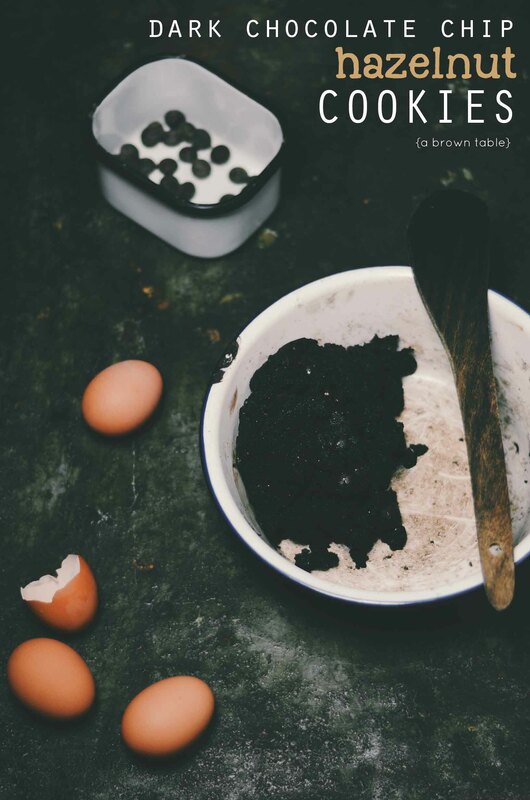 In a small bowl, whisk the egg, vanilla extract and browned butter. Make a well in the center of the dry ingredients in the large mixing bowl and stir the whisked liquid into the whisked dry ingredients with a silicone spatula. Bring the ingredients together to form a ball of dough, wrap with cling film and refrigerate overnight. 4. Preheat the oven to 350F and place a wire rack in the center of the oven. Line two baking sheets with parchment paper. Divide the dough into 12 equal parts and roll each of them into balls. Flatten each ball with the palms of your hands into approximately 2 inch discs. Space 6 cookies on each sheet about 1-2 inches apart from each other. Place the baking sheets in the refrigerator for 10 minutes. Bake one sheet at a time in the oven for about 8-10 minutes until the edges of the cookies start to get crisp, the center will be slightly soft to touch. Rotate the cookie sheet halfway through baking. Do not over bake the cookies as the chocolate will burn. Repeat with second sheet of cookies. Allow the baked cookies to cool for 5 minutes on the baking sheet and then transfer to a wire rack to cool. Serve the cookies warm. In "Baking", "Chocolate", "Cocoa", "Cookies", "Dessert", "gluten free", "hazelnut"